These Naturalistic Terrariums exclusively feature; Full Front glass opening door with snap closure, Stainless Steel screen top will not corrode and accommodates a Dome Clamp Lamp Fixture or the Optional "Light Bar". 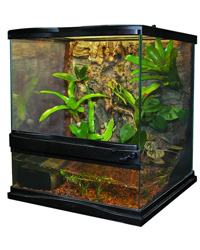 This special screen top keeps feeder insects in while allowing greater UVA and UVB penetration throughout the terrarium. Water-tight base allows for a 6 power cord and airline tubing exit slots with.